would sure come in handy. I like you via FB!! I’ve always liked your blog and liked you on facebook as well. Great giveaway and thank you again for all your saving tips! You are my go to site for all Target shopping…Thanks! Wow!! This would be awesome in this holiday season. I also follow yoiu on FB. I would love to have it. Pick me please! this would be nice for all the after christmas sales!! You are my go to site for anything target and I follow you daily! And have the automatic feed! I would love this more than my kids! Tom and Jerry eat your heart out! Would love to win!! I already like you on FB!! Thanks!! i hope i win!! please pick me…. Love your blog. Thanks for the giveaways!! This would be soooo nice! This would be awesome to play with my cats!! Would love this! Thanks for the great giveaway! I’m fairly new to Totally Target and so far I totally love it! Let it be me, let it be me! Thank you for the giveaway! I already like you on Facebook. Thanks for all you do. Would love to win this one. I love Target and I love your website. Would love to win this one. Thanks for all you do to save us money! 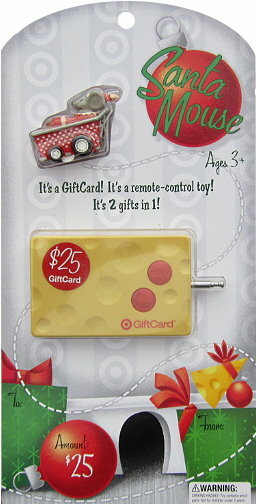 And where do you get all these cute Target gift cards? I love all your giveaways. Yeah free Target $$$$$ yahoooooo! Thanks for these giveaways!